Status: Rare casual spring migrant west, accidental east. Rare casual fall migrant west and central. Documentation: Photograph: 16 May 2008 Crescent Lake NWR, Garden Co (Brogie 2009). Taxonomy: Two subspecies are recognized (Pyle 1997), although Guzy and Lowther (2012) synonymized them as poorly differentiated: nigrescens, breeding from coastal southwest British Columbia to west-central California, and halseii, breeding from interior southern British Columbia and south-central California east to Wyoming and southwest Texas. Breeding birds in Wyoming are halseii (Faulkner 2010), and presumably Nebraska migrants are also of this subspecies. 25 May 2000 first-year male Otoe Co (Falk 2002; Jorgensen 2002). Among the three additional undocumented reports, one in Scotts Bluff Co 19 May 1974 Scotts Bluff Co is likely correct. Johnsgard (1980) listed additional reports for Cherry and Garden Cos, but no dates or details were provided. There are two accepted reports. 7 Sep 2001 female Oliver Reservoir, Kimball Co (Silcock 2001). A photograph of a purported adult male at Oliver Reservoir 8 Sep 2007 was considered inconclusive by NOURC (Brogie 2009). This sighting is currently (31 Oct 2017) under reconsideration by NOURC with supplemental written notes. A bird seen 23-24 Aug 1967 at Tryon, McPherson Co (Bassett 1968, Williams 1968) may have been correctly identified. There is one other fall report, 20 Sep 1979 Douglas-Sarpy Cos. Comments: This species breeds locally in southeast Colorado and north in the foothills to north-central Colorado (Andrews and Righter 1992). 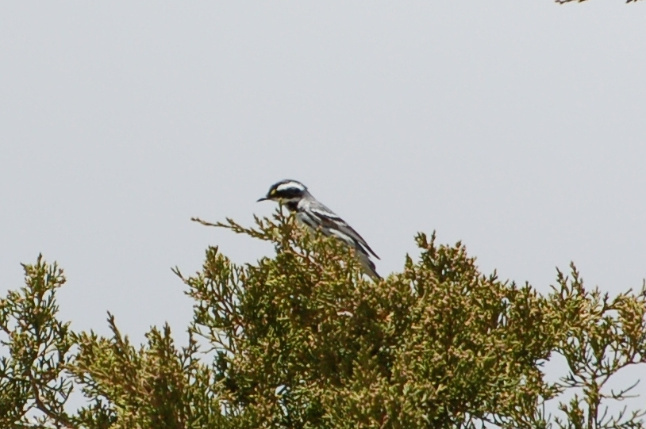 Faulkner (2010) stated that it is a mature-growth juniper specialist, breeding in central and southwest Wyoming and rarely found elsewhere; there are two sight records of migrants in the southeast corner of the state. At Barr Lake, Colorado, there are five records 6-13 May and 4 records 30 Aug-12 Sep (Andrews et al 2002). Spring migrants are rare but “probably regular” in southwest Kansas, and have occurred statewide (Thompson et al 2011). In Iowa it has been recorded east to Sioux City and Cedar Co (Kent and Dinsmore 1996; Kent 1997), and in South Dakota east to Sioux Falls at the eastern edge of the state (Tallman et al 2002). Photograph (top) of a Black-throated Gray Warbler at Crescent Lake NWR, Garden Co 16 May 2008 by Cory Gregory. Bassett, O. 1968. Black-throated Gray Warbler. NBR 36: 15-16. Dinsmore, S.J. 2000. Black-throated Gray Warbler at Oliver Reservoir. NBR 68: 46. Kent, T.H. 1997. Field Reports- Spring 1997. Iowa Bird Life 67: 84-94. Williams, F. 1968. Southern Great Plains Region. Audubon Field Notes 22: 57-60.